Attorney Tammie Mosley anounces her candidacy surrounded by supporters. 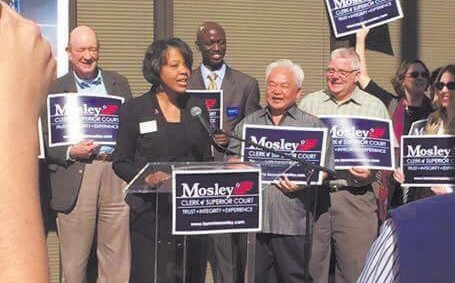 Tammie Mosley will formally announce her candidacy for Clerk of Superior Court for Chatham County on Thursday, March 3. She will make the announcement out front of the Chatham County Courthouse at 10 a.m. Incumbent Daniel Massey is retiring and not seeking re-election. Mosley is a native of Savannah and experienced attorney of 22 years. She returned to Savannah in 2003 and has worked as Senior Staff Attorney in Superior Court for Judge John E. Morse, Jr. for 13 years. The Clerk of Superior Court is the “primary record keeper” of all of the official records of the County’s Superior Court, which provides protection of the public records including all real estate deeds, liens, and records along with all pleadings of civil and criminal cases. The Clerk of Superior Court is one of four constitutional officers in Chatham County. As “primary record keeper” this is a vital position to the efficiency of the Superior Courts of the County and the clerk’s designated duties if done correctly ensure that the court system flows properly. As Clerk of Superior Court, Mosley will ensure the continued security, maintenance, and retention of all of the real estate and case records in Superior Court. Mosley will work to address the present day and future needs of customers of the Clerk’s Office in carrying out the duties of Clerk.